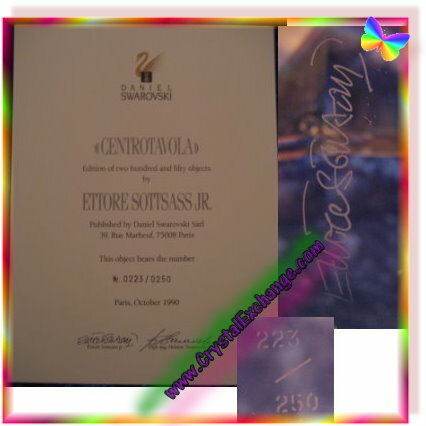 For those SCS members participating in the Swarovski Crystal Society Event celebrating 25 years, February 23, attending the Private Member Reception and purchased the qualifying SCS product there were special gifts. One of the special gifts were the SCS Jubilation Crystallized Chopstick Set with the Swarovski system # 1 166 190. These Swarovski Chop Sticks are about 9 1/2″ long tapered sticks, are made from a shiny white material (probably plastic), and have crystal stones encircling the larger end, with a larger clear crystal covering the larger end. There is also a small white chop stick rest that accompanies the chop stick set. The Swarovski Jubilation Chopstick set is the second set of Swarovski chopsticks produced by our favorite crystal brand. The first set was part of the Swarovski “Dressed Up” collection. These were of wooden construction, painted black, tapered sticks and 8 rectangular crystals (placed length wise) at the larger end and marked with a Swarovski swan on the opposite side of the taper. These chopsticks came as part of the ‘Dressed Up’ Plate, 606 978 / 9280 000 058, available from 2002 to 2004 and these Dressed Up Chopsticks could not purchased separately. The crystal giant also made a crystal Swarovski Chop Stick Holder (set of 2), using the identification #’s 606 984 / 9280 000 066, from 2002 to 2004. The Swarovski Chopsticks gifted at the recent event may be offered at additional store events in 2012, so if you are wanting to add them to your Swarovski crystal collection, you will want to check with stores hosting official Swarovski events. 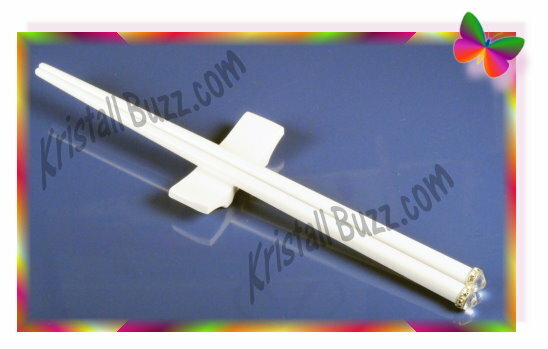 If you ware wanting the retired Swarovski Chop Sticks that were included with the Dressed Up Plate, they may be found at the Crystal Exchange America website in the Swarovski Crystal Home Accessories category. The Swarovski Home Accessories product line has under gone a number of name changes, since the inception in 1992. The line was introduced in 1992, as Swarovski Selection. The initial release was 12 pieces, ranging in price from $325.00 to $995.00. Some of these Swarovski crystal issues, were limited by the number of pieces Swarovski would produce, believing it would make it more desirable to the collector. Being failrly simplistic designs, Silver Crystal collectors did not take a fancy to them. Also, with the price point was on the high side, collectors were indeed selective about what Swarovski Selection figurines were added to their crystal collections. In 2002, the product line name changed to Swarovski Crystal Décor. From 2003 – 2007, the product line was known as Swarovski Crystal Home Accessories. In 2008 – 2010, it was Swarovski Home & Interior. Now, in 2011, it is called Swarovski Home Accessories. While the product line name changes evolved due to times, collector tastes, and other reasons, the constant change does make it more difficult for the collector to keep track of Swarovski product lines offered. 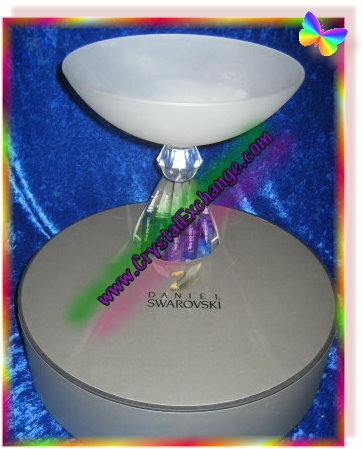 In 2004, Swarovski reassigned some crystal figurines from Silver Crystal to Crystal Home Accessories, probably the most memorable are the Waterlily Candleholders. There have been numerous theme groups over the years, Mood for Ice was probably the most unique. Other theme groups included the Jewels collection, Crystal Jewels, Dressed Up, Out of Africa, Op Art, Rainbow, Crystal Leaves, Crystal Celebrations, and Crystalline. Crystalline is the only theme group still in use today. 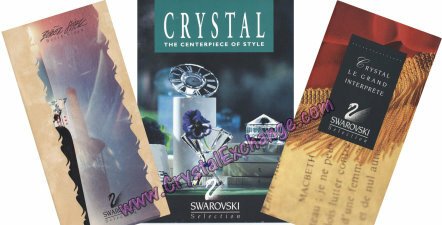 Crystal Exchange America has a variety of retired Swarovski Crystal Home Accessories figurines on their web site. They can be found at http://www.crystalexchange.com/c-CHA.html .